Over the holidays, The Food Network was airing all the Jamie Oliver holiday specials. He is a big favourite in our family — with a simplistic style, he always takes delicious ingredients and makes straight forward, easily accessible, plain ol’ good food. Rinse your brussel sprouts. Then slice the ends off and peel away the outer layer of leaves. Discard the leaves and cut the sprout in half and set aside. Continue until all the sprouts have been halved. 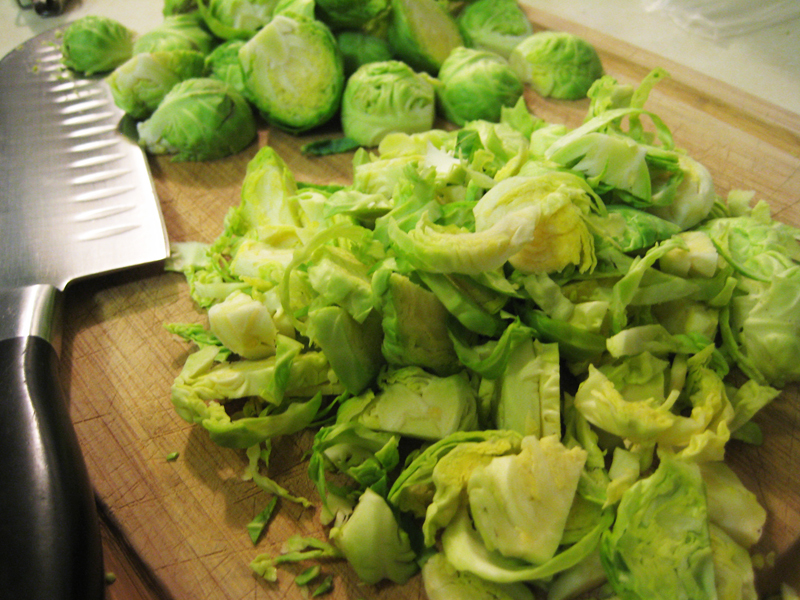 Then, one by one, place each half on its inside and finely chop until you have thin strings of brussel sprout. Place in a bowl and set aside. Preheat a pan on med-high heat. My brussel sprouts usually accompany a pork tenderloin so I like to use the same pan I roasted the loin in while it’s resting. Once the pan is hot, throw in your diced cured meat. 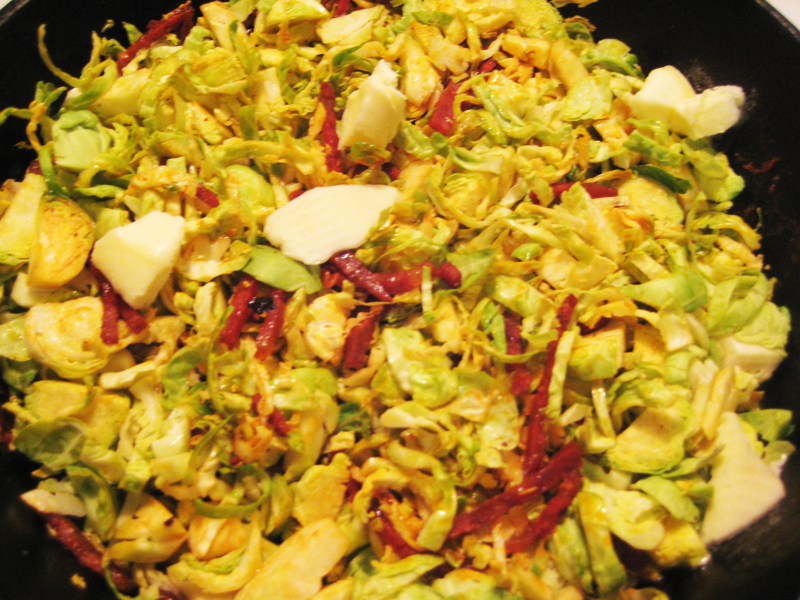 Once the bacon/chorizo/salami/sausage begins to brown and the fat renders a bit, throw in the shredded brussel sprouts. Add your butter and stir until the brussel sprouts are coated and browned. Remove from the heat and your ready to serve along side your preferred meat of choice! See The Perfect Pork Tenderloin. Mmm! The prepared brussel sprouts look much more complex than the ingredients indicate. They look fantastic. Thanks, Aldy! 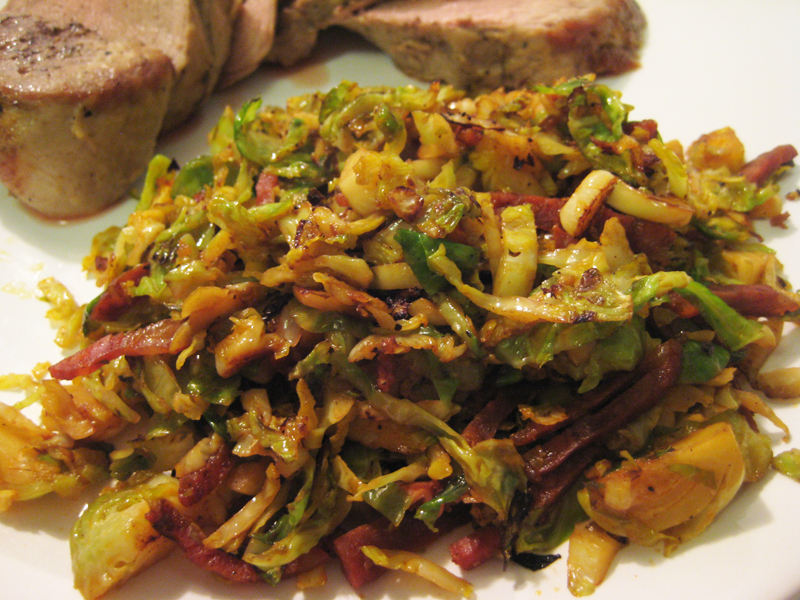 It’s such an easy way to spruce up your typical roasted sprouts. And the flavour difference is INCREDIBLE. Your sprouts look so so good. Thanks, Susannah! This recipe really was pretty much stolen from Jamie Oliver’s holiday special. I’m totally going to make this!!! Thanks for the recipe! Marvelous website, thanks a lot ! !